One of the UK’s leading Mechanical and Electrical Companies, Working Environments, have had their Southampton head office extended and refurbished by principal contractor Hampshire Mezzanine Floors to accommodate their growth and expansions plans. Working Environments, who have been operating since 1974 are part of The Environmental and Process Engineering Group, are highly regarded as one of the UK’s leading companies in their industry. Working Environments asked HMF to be the Principal Contractor for the project, in which HMF created additional floor area within Working Environments’ existing buildings by installing four mezzanine floors. The addition of these mezzanine floors allowed for additional offices, staff break out areas, meeting rooms, storage and an auditorium to be built. Additional welfare facilities were also provided, incorporating cubicle systems and full glazed vanity units. HMF worked closely with Working Environment’s own mechanical and electrical team to carry out the works in a phased operation to ensure that their staff were still able to safely operate within the premises and also to minimise disruption to the business. As part of the £750,000 project, the entire building was re-decorated and full height glazed partitioning and suspended ceilings added to form the additional facilities. 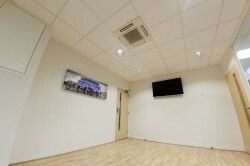 This was complimented by the latest LED lighting and air conditioning systems provided by Working Environments. The result was a top working environment for their staff and visitors who can now enjoy working in pleasant surroundings. This is not the first time that Working Environments have worked with Hampshire Mezzanine Floors, with HMF previously installing a mezzanine floor for them, creating five additional meeting rooms, breakout area, a boardroom and kitchen facility. Hampshire Mezzanine Floors have been fitting out existing buildings as principal contractors across the UK and the Channel Islands for over 26 years as design build fit out contractors.